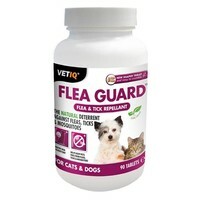 VetIQ Flea Guard 90 Tablets is a completely natural and unique blend of ingredients which aid in the control of fleas and ticks. A superb natural deterrent for fleas and ticks, these tablets are easily administered orally and leave no lasting chemicals in your pets’ skin or bloodstream. VetIQ Flea Guard causes your pet to give off a pleasant smell that insects find unpleasant and simply cannot stand, with the added benefit of reducing soggy doggy smells and keeping your pet free from odours. Garlic Extract – A natural repellent against insects. Also contains natural anti-bacterial and anti-fungal properties which aid the immune system in resisting infection. Yeast Extract – Rich and natural source of essential B-vitamins which are important for promoting overall health, including a shiny coat and a strong immune system. Can Highly Recommend this outstanding Product. We have been using Vet IQ Flea Guard tablets for a good couple of years & the product is outstanding. It is a brilliant alternative to the usual nasty's available & it really does work. Our dogs were always coming home with ticks & we used the tick remover on a regular basis alongside commonly used products to repel them. Then we were recommended Vet IQ Flea Guard & we’ve never looked back. Our dogs have never looked better. What a godsend this natural product is. In over two years all dogs have been totally tick free other than 1 dead one which had the audacity to give it try !! Well done to Vet IQ for such an outstanding natural product. I have been using Flea Guard tablets on my dogs for several months and they really work. Highly recommended. 5 stars. Bought these to go with some other flea treatments I bought on here and they seem to be working nicely. My dog who is a super fussy eater scoffs her food down since I've been mixing these with her meat and biscuits. Definitely recommend these.